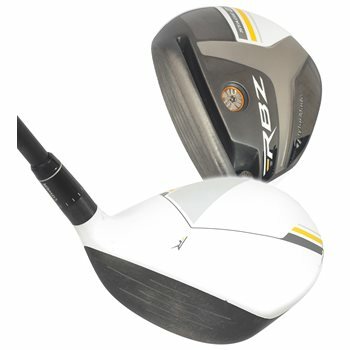 The TaylorMade RocketBallz RBZ Stage 2 Tour fairway woods features a new ultra-high strength RocketSteel material which creates a thinner and faster flexing face. The improved speed pocket design allows for faster flexing to promote faster ball speed and more distance. The lower and more forward CG promotes faster ball speed, high launch and low spin. The shallower, lower profile head shape allows this fairway wood to be playable from a variety of lies and provides a higher launch with ease. This fairway would is adjustable and features TaylorMade Loft-Sleeve technology. This offers 7 standard and 5 upright loft options to add ±1.5° to the standard loft. Longer and faster than original RocketBallz Tour fairways. TaylorMade Loft-Sleeve technology offers 7 standard and 5 upright loft options to add ±1.5° to the standard loft. 3-wood loft is 14.5° (which can be adjusted up to 16° or down to 13°). Ultra-high strength TaylorMade RocketSteel supplied by Carpenter® creates a thinner and faster-flexing face. Speed Pocket design flexes faster to promote faster ball speed and more distance. Lower and more-forward CG location promotes faster ball speed, high launch and low spin. Shallower face and lower head profile for increased playability and easier launch. Thick-Thin Crown design saves weight that’s redistributed to improve CG location. Black clubface, non-glare white crown and new crown graphic all promote easy alignment.